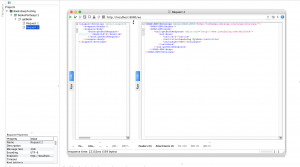 In this post, we will see how to create soap web services with Spring boot. We will create contract first soap web service with Spring boot. We will focus on how to define configurations for soap web services. 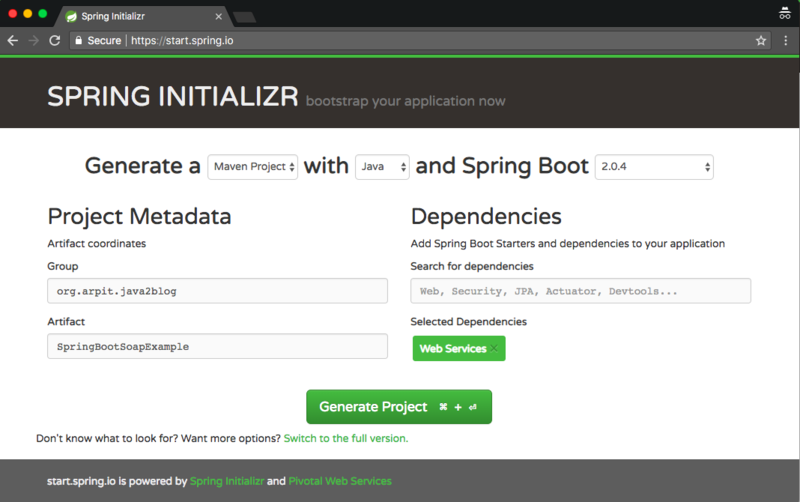 Let’s create a simple spring boot application. Step 1: Go to “https://start.spring.io/” and create spring boot projects as per below screenshot. Step 2: Import the maven project in eclipse. Step 3: Add wsdl4j dependency to the POM. step 4: Create a xsd file named “book.xsd” in resource folder. As we are creating contract first soap web services, we need to define XML schema file (XSD) that Spring-WS will export automatically as a WSDL. We are creating book.xsd which will return book with its id, title and number of pages. Step 5: We will generate domain classes based on XSD now. We will use JAXB maven plugin to generate domain classes based on XSD. So when you run maven build, these domain classes will be generated. Step 6: Create a BookRepository.java.This repository will provide dummy data to web service. step 7: To create Book service endpoint, we just need to annotate a POJO with Spring WS annotation to take care of SOAP request. Let’s see more details about above annotations. @Endpoint: This annotation is used to register the class with Spring WS for processing incoming SOAP request. @PayloadRoot: This annotation helps Spring WS to pick handler method based on message’s namespace and localPart. @ResponsePayload: This annotation indicates that incoming message will be mapped to method’s request parameter. @ResponsePayload: This annotation is used to Spring WS map the return value to the response payload. step 8: Create a new class named WebServiceConfiguration.java which will contain Spring Web services related beans configurations. Spring Ws usees MessageDispatcherServlet to handle SOAP message. It is important to set ApplicationContext, otherwise Spring WS will not be able to detect Spring bean automatically. DefaultWsdl11Definition exposes a Standard WSDL using XsdSchema. 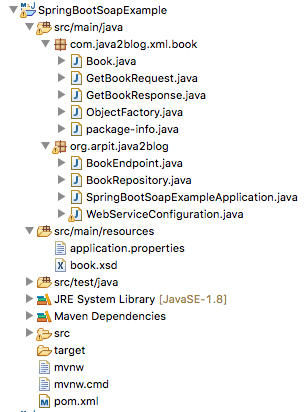 step 9: Create the main java class named “SpringBootSoapExampleApplication.java” which will have main method. Step 11: Check WSDL URL. Hit the above URL and you will get below WSDL file. Create a project on SOAP UI using above WSDL file and test the application. Here is the screenshot from SOAP UI. That’s all about Spring Boot SOAP Webservice Example.